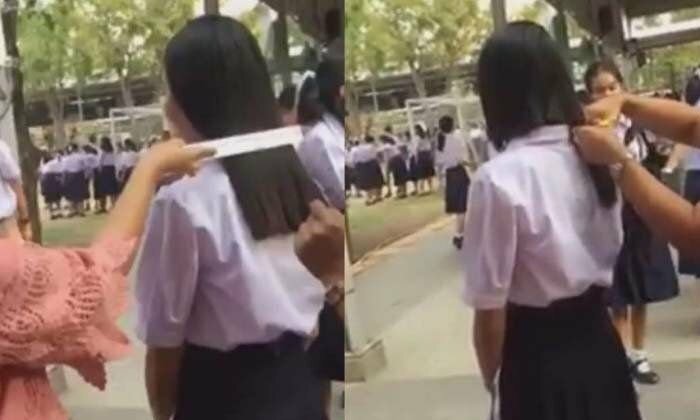 Thai social media went into meltdown after a clip showed teachers at a Kanchanaburi school cutting a high school student's beautiful long hair. But as netizens slammed the actions of the school came news that the friend who filmed the shearing has had her grades cut as a punishment for causing the school to lose face. A school representative has said it is terrible that such a "small matter" has caused so much trouble as she had a go at social media groups for "attacking her school". The school has said that they were within their rights and everyone knows the rules. But most netizens disagreed, said Sanook, saying the school had overstepped the mark. The short clip shows a teacher with a ruler measuring the M4 student's hair. Then another teacher with scissors cuts it. The rules say that it cannot be more than 9 inches from the top of the ears. Phawadee Jittamai, deputy director of student services at Kanchanaburi Khroh School in Muang district, said the cutting happened on January 10th and was done according to the school rules. These were published in the school handbook and everyone knew them since orientation day at the start of term. She said that the girl concerned had been warned many times but had refused to have her hair cut. She confirmed that the student who filmed the incident had had her grade points cut for causing the school to lose face. Thai Rath said that the girl who filmed on her phone had apologized and taken the clip down from social media. It was posted on "Black Cat" on Facebook. Thai Rath quoted Phawadee as saying that the student would not be expelled - would just lose grade points. Her parents had contacted the school about that matter. The media said that the situation in the school was calm - in stark contrast to social media where the clip was being shared thousands of times. A M4 school representative called Sarita Lakhonsee was more forthright than the deputy director. Sarita said: "It's a shame that such a small matter has caused such a furor and caused the school to be attacked. "The attacks from certain social media groups are unwarranted. The rules are clear and we don't insist on the hair being too short. The student knew the rules and that's that". So the girls hair a 15 seconds is not a problem? I dont get it....but I dont think I am supposed to....Rules in this country often follow no rhyme or reason. that the friend who filmed the shearing has had her grades cut as a punishment for causing the school to lose face. Sadly that is the Thai mentality for you all over. Rather than set a good example in being positive about actually learning something useful, the schools follow archaic rules and then when they lose face, strike out against the person who revealed their idiocy. Utterly disgraceful, but very much the norm, and probably a fair contributor to the poor academic performance of kids nationwide. In the west an action like this would be classed as physical assault and a criminal offence. Happens all the time as well as canning. Nothing new and it will never change. The Thai law that teachers are not allowed to hit or cane children is also very very clear but thousands of teachers ignore the law and hit / cane children, often causing severe markings on skin, blood, bruising etc. Teachers are forbidden by the law to do this but without hesitation they ignore the law. Where's the Ed. ministry? No comment, asleep, too lazy, incapable of construction a comment, as usual. Yes, and that is why this country will always and forever be 'Third World', despite all their protestations and ambitions. I never saw any reference to preserving the hair that was cut by "canning" it. Why would anybody do that? One of our Thai Nephews is a village teacher. He is a serious and dedicated young man and I know that he treats the children well and is liked and respected by his students. However, after Military service, he trained as an electrician and then took up teaching. Zero teacher training for him and zero checks done on his competence to teach. I do like the lad, but his level of pure knowledge and awareness of the outside world is minimal to say the least. That says everything that needs to be said about the education system here. news that the friend who filmed the shearing has had her grades cut as a punishment for causing the school to lose face. Yes, that sounds to be pretty well in-line with Thailand's forward-thinking Education dept. Loss-of-face = loss-of-grades . . . good maths? . . . well, at least better than the normal.